More than £160million was wiped off the value of one of Britain’s biggest builders last night as storm clouds gathered over the housing market. 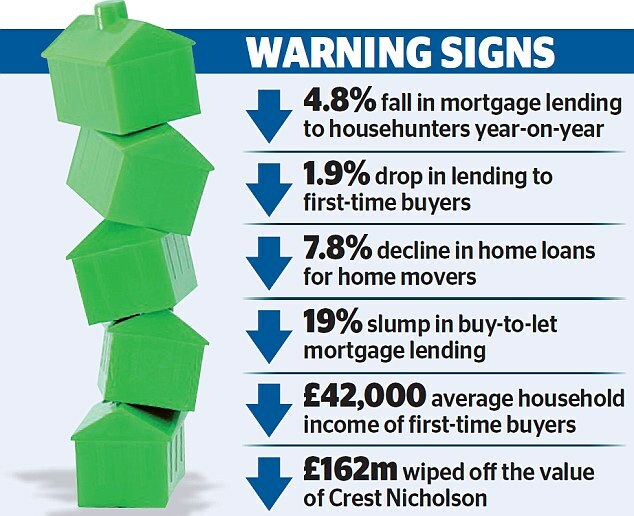 As industry figures showed mortgage lending is on the slide, shares in Crest Nicholson dived 12.8 per cent after it warned that house prices have peaked but the cost of building them is rising. There were also signs that taxes and regulations have suffocated the once-booming buy-to-let market. Russ Mould, investment director at AJ Bell, said falling mortgage applications ‘could filter through to house prices if the experiences of the past decade are any guide’. In the US, work started on 3.7 per cent fewer homes, suggesting that the American housing market is also starting to run out of steam. Having seen the average price of its homes rise 5 per cent to £439,000 in the six months to the end of April, Crest Nicholson said ‘this is expected to represent a peak level’. The FTSE 250 group warned that the cost of building new homes was still rising, making the business less profitable. Developers have been hit by the rising cost of materials as well as the cost of employing workers. 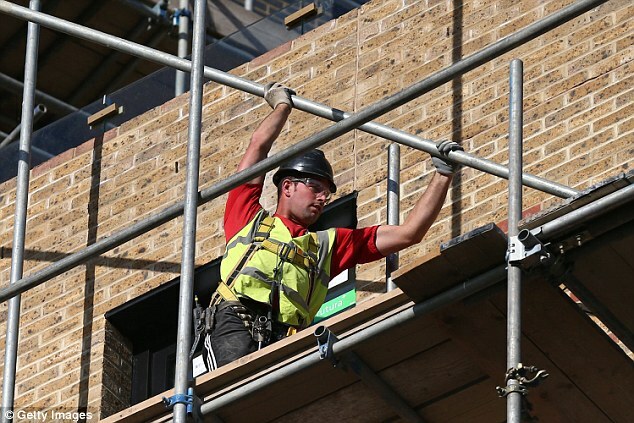 Shares in Crest Nicholson fell 63.2p to an 18-month low of 430.6p, wiping £162million off its value. Meanwhile, figures from UK Finance showed 59,600 home buyers received mortgages in March, down 4.8 per cent on the same month last year. While the number of loans to first-time buyers fell by 1.9 per cent, there was a 7.8 per cent slump in lending to families moving home. The report showed just 5,500 buy-to-let mortgages were extended in March – down 19.1 per cent year-on-year. Landlords have been hammered by a stamp duty surcharge of 3 per cent on such homes and reduced tax breaks, as well as extra affordability checks by regulators at the Bank of England. Analysts warned that there was little prospect of a recovery in the buy-to-let market given the Bank’s plans to raise interest rates in the coming months. But they added that while property prices in London have put off many buy-to-let investors, other parts of the country still represented good business. James Cameron, of property manager Vesper Homes, said: ‘Many investors, both from the UK and overseas, are holding back from investing in London at present. ‘We have seen a shift in interest from London to cities such as Manchester where there is great value to be had, lower entry points and the ability to get a decent yield, even with the tax changes.